One of the most valuable elements of the ePropertySites platform is the virtual tour feature. As you know, this feature is one of the many included with your $10 single property website (or other monthly plan). The best part of our virtual tours? We build them for you! Here’s how it works: The moment you add the final photo to your gallery, the ePropertySites system instantly builds your virtual tour, including your image captions, background music, and image pans. If you’re happy with the tour we created for you, you’re done! No additional work is required on your end; simply save your progress and go on with your busy day. 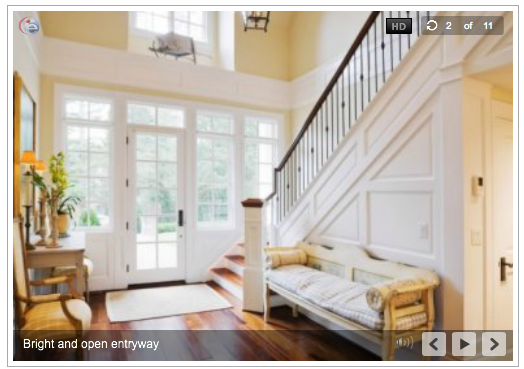 Your mobile-compatible virtual tour will automatically be included in your property website. If you would like to customize the virtual tour, you can also spend a few moments adjusting the order, image pans, or selecting different background music. Here are some advanced tips for how to create a virtual tour that turns every property into a stunning presentation. Make sure you upload your images in the order you want them to play during the virtual tour. Make sure your image captions are brief, but descriptive. Make sure your photos are high quality. Aim for always using HD images to allow your virtual tour to be played on a full screen. Check out our example of a default virtual tour. Beautiful? Absolutely. But what if you’d like to tweak it a bit? Really think about the direction of your image pans and zooms. For example, if the room has a beautiful fireplace, zooming in would highlight that feature nicely. When in doubt, pan left to right. Our eyes naturally travel this direction, and it will give your images natural-feeling movement for your viewers. Carefully select your audio. Buyers viewing a virtual tour for a coastal cottage don’t want to listen to a twangy country song. Try to make the entire viewing experience feel cohesive and generally appealing. In this customized virtual tour example, you can see how the custom voiceover and image movements work together to elegantly present this property. For more questions about virtual tours, visit our User Guide or call our live support hotline at 949-328-5000. More virtual tour examples can be found here and here.